Although there are plenty of these restaurants all over Tokyo, this one is a little different. It's small form-factor and large round bar make it perfect to have a drink, some food and have a chat with some of the locals. Friendly and fairly cheap, this place offers a range of food for all tastes. They also specialize in collecting rice wine sake from all over the country. So if you are a sake connoisseur or just fancy some decent sake, this may be the place for you. Yes you got all the Izakayas but in the the small towns/ areas you can find cheap place called "akachochin" just look for the red laterns outside the bars. If you are eager to see an evening city view of Tokyo but are unwilling to fork out the two-thousand yen or so it costs to take a trip up Tokyo Tower or the Mori Building in Roppongi Hills then check out this one. Set in the business district of Nishi (west) Shinjuku in the Sumitomo Building, this Izakaya is on the 52 floor. Called Yui-an, it combines a commanding view of Tokyo with some excellent and reasonably priced food. Better book in advance if you want a jaw-dropping seat by the window. 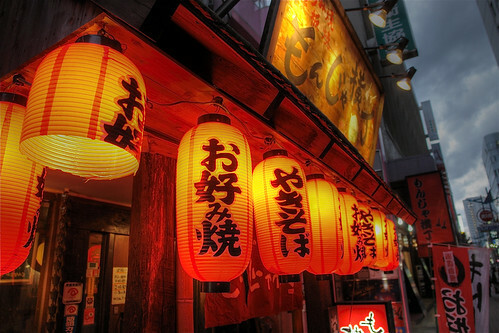 If you're looking for somewhere cheap and cheerful to eat during your stay in Tokyo, check out some of the 'Izakaya'. These provide some of the widest choices of food you can find in Japan and cater to all tastes. Most dishes are shared dishes so you can order an array of dishs and try each one. Both beer and food are cheap and . Prining this page would give you a good reference. Often they are located on the upper floors of buildings so focus your gaze upwards find the floor and head up on the elevators. Here are a pick of choice Izakaya you can try for a change.